The week’s image of the week is taken from an installation by artist Eamon O’Kane whose work is currently on show at CCA Derry~Londonderry. I last saw O’Kane’s work at Dublin Contemporary in 2011 and upon looking at his website have now realised that not only is he a brilliant sculptor/installation-maker, his paintings are also staggeringly good. Here we have a chance to look at yet another exceptional element in his practice – photography. 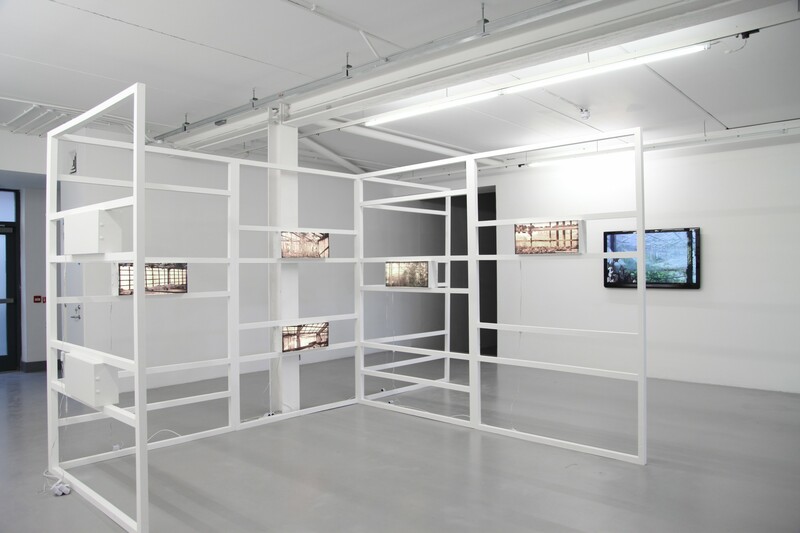 The work now showing at CCA Derry~Londonderry entitled Where there are people there are things, details a derelict plant nursery in Odense, Denmark and continues the artist’s ongoing interest in how people interact with architecture. The installation itself is typical of O’Kane’s manipulation of the gallery landscape into the terrain of the work. The framing of the photographs in the 3D grid referencing architecture certainly, but also Art History. Centre for Contemporary Art, Derry~Londonderry. Posted in Comment, images, NewsTagged CCA Derry Londonderry, Eamon O'KaneBookmark the permalink.